Last week was actually a fun thrifting week for me. I went out on Wednesday with my good friend, Vicki, to the Cartersville Habitat Restore to see what they might have that I would be interested in. Everything was 1/2 price, then an extra 20% off for senior citizens. Ummmm, I’m embracing my senior status these days and taking those discounts. Are you? Yep, I will admit to being 55 if it gets me a discount any day. I found this adorable little armillary lamp for $2. No shade, but I took care of that at Ballard’s on Friday. I paid $18 for the shade, but I figured a $20 lamp wasn’t a bad deal. And besides, that shade is so darn cute. I love armillary shapes and this one was too adorable and classic to pass up. I will find a spot for it! These curtain rods will be put to good use too. The larger one was $3 and the small one was a mere $1. I may paint them, we’ll see where they end up. Curtain rods are expensive to buy. Then on Friday, I met up with some bloggers here in Atlanta and we had lunch and hit the Ballard Designs outlet in Roswell. You never know what you’ll find in there at any given time. Last time I went in there, I brought home 2 light fixtures. This time, I brought home another one. And boy, did I hit the jackpot on this one. Like, the deal of the century jackpot. My friends tell me I can sniff out the bargains wherever I am. I do believe they may be right. This has happened to me so many times over the years. Technically, this is not a thrifty treasure bought 2nd hand, but I’m breaking my own rule on this one. This cute guy is Tim and he works at Ballard’s. He is my friend now. I was walking through the lighting peering up at all of them, when this one caught my eye. I was squinting trying to read the price tag, but couldn’t quite make it out. I thought I saw a 3 and a 2, but wasn’t sure what it said. Tim jumped up on a pile of rugs to read it for me. That has to be wrong, he thought so too, but checked with another guy who seemed to have some clout. The guy said, yep she can have it for that, it might be marked wrong, and it might have been here awhile, but it’s marked, so we’ll give it to her. YAY! I’ll take it, I scream….$32 is a steal for this $400+ light fixture. Cute Tim took it to the front for me. When I got up there, the same guy who had OK’d the price took off an additional 75% (because that is what lighting is marked right now) and….drumroll please……I got this beauty for $8. I know. Hate me now! I do believe it will go in my living room. Lookie here! This is a pic I took at the Ballards house at Serenbe a few weeks ago. There is is, looking beautiful in this bedroom! Several of us Atlanta home bloggers got together for an outing last week. In fact, if you are in Atlanta and want to join our Facebook page, please let me know and I’ll send you the link. Great way for bloggers in the area so get together and socialize. I had on my ambassador role hat for Hometalk going on and gave all the girls t-shirts and we wore them while shopping Ballard’s. If you haven’t visited Hometalk, you must! Great place to share your projects, things you are proud of, your home pics, or if you have questions about anything, you can ask away over there. There are plenty of professionals and home owners who will be happy to jump in and help. As a blogger, you’ll get a ton of exposure for your blog projects and house sharing. House sharing is encouraged! Jump on over to Hometalk and join the fun! In fact, if you want to have a Hometalk party of your own, go here for all the details. Hometalk will send you some free goodies for you and your group and you can host your own party too. 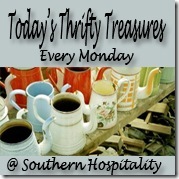 So, back to last week’s Thrifty Treasures party, here are a few that caught my eye. See how April at A Heart’s Desire scored a FREE island!! Yes, free, that’s the best kind of frugal. They had to do a little repair on it, but wow, is it pretty now. Cheerful Thrifty took home 63 pieces of Staffordshire English ironstone transferware for $15. WOW, that’s a great deal! What’s with the freebies last week? Debbie at Refresh Restyle, scored big time on this vintage sofa for FA-REEEEE (is that Duncan Phyfe style, Debbie?). Love how she made it over, it’s a beauty now. Kim at Reposhture painted an older piece in this pretty two-toned finish. I’m seeing more and more older pieces done this way and it’s really eye-catching. She got this piece along with a table and chairs at Goodwill several years ago, all for $50. I’d say she got her money’s worth! Another 2-toned beauty, My Passion for Décor, took a peeling Craigslist dresser and revamped it into a thing of beauty and usefulness using Annie Sloan chalk paint. Five Eleven Décor shows all the fun stuff you can find while thrifting, all in one day. Love this stash of goodies! the light was a fantastic deal! and a cute guy like that would make me go back much more often…. awesome treasures! I’m not 55 yet, but I did have one day last week when I was both carded AND asked if I wanted the senior discount! So happy for your for your awesome score of that chandy! Can’t wait to see it in your new home. Thank you for hosting the link up party. Such fantastic finds, Rhoda! I can’t believe you scored that fabulous light fixture for only $8. It will look great in your new home. I’ll just throw it all out there right now Rhoda – I’d hit you over the head for that chandelier! HUGE SCORE! Ha, Jaye! You made me giggle with that comment! Thanks for hosting! I can’t wait to see what everyone else shared! Wow what a deal. It will look fantastic in your new house. Can’t wait to see it in place. When I was checking out to buy my outdoor rug, the check out guy said to me “You know you are paying more for this rug, than she did for that Chandelier?” lol Yes. Thanks guy! Super terrific, blowout, deal of the century Rhoda! Thank you for the feature of my two toned buffet. Just came back from vacation and saw the feature. What an excellent surprise!! So humbled to be included with these fine ladies and considered by you! Looks like you all had a fabulous day!